Where are my Favorites stored? 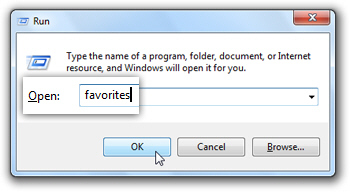 The location of your Favorites folder depends on your user name and your version of Windows. In this tutorial, we will first show you how to quickly open your Favorites folder without having to know where it is located, and regardless of your version of Windows and Internet Explorer. We will then give you the actual path where your Favorites folder is stored, for your particular version of Windows: this tutorial applies to Windows XP, Windows Vista, and Windows 7 (and Internet Explorer 6 through 8). The keyword "Favorites" is not only the name of the directory in which your Favorites are stored, but also a keyword you can use to open your Favorites directly, with a couple of keystrokes. To open the location of your Favorites folder, click on Start and choose "Run". If the Run command is not visible on your Start Menu, simply hold down the Windows logo key, and press "R". Windows will open the proper location where all your bookmarks are stored, and display your Internet Explorer Favorites folder inside Windows Explorer. As you can tell, your favorites (both actual bookmarks and any folder you created) are just a listing of shortcut files and folders. If you click any of the shortcut files (each representing a Favorite), they will open the target URL (internet address) inside your default browser. Copy the updated Internet Explorer Favorites path, press Windows+R to launch the Run dialog, paste it and hit Enter to open the folder in Windows Explorer.